All of us at Sturbridge Yankee Workshop hope that you and your family had a very happy and safe holiday weekend. We mentioned Friday that the new Winter 2013 catalog is in the mail and customers should expect to see it any day now. For paperless viewing, click Here. And with the new season, comes the celebration of our Annual Seating Sale. Today’s blog features two of our new seating collections. Let’s take a look below. Pictured here to the left is the attractive Lattice Back Seating Collection. 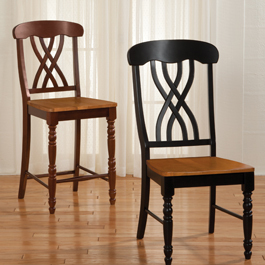 Offering both a dining chair and counter stool, this collection boasts the classic interwoven design on the seat back. Solid hardwood construction in combination with the overall rounded appearance of both styles, adds instant good looks to a kitchen or dining environment in your home. Turnings on the front legs further the design detail, and you’ll love the slightly contoured seat. Customers will have the option for either a Black with Cherry Stain seat or an Espresso with Cinnamon Stain seat, to coordinate with their existing décor. During the current seating sale at SYW, a set of two chairs can be purchased for just $349.95, and one 24″H counter level stool can be purchased for $199.95; that’s a savings of $50 each. Another new collection for the winter season is our distinctive Turn Post Seating Collection, shown to the left. This collection includes a standard dining chair and three sizes of stools. Proudly made in North Carolina, the profile resembles our five-star, customer rated Ladderback Seating Collection. Featuring hand woven twisted paper seats, these sturdy and attractive stools and chairs are formed with beautiful carved turnings on their posts. The chairs present a steam bent, ladderback style seat back, while the stools offer a backless alternative. Handcrafted of solid ash wood, this collection is strong in attention to detail and fine American craftsmanship. 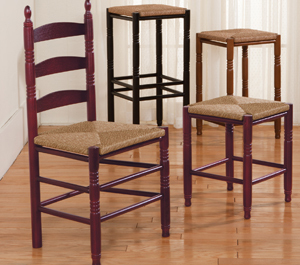 Add durable Turn Post Seating to your kitchen, dining room or other casual living area. The stool height options will provide versatility to an at-home bar. Customers can choose from a Black, Cranberry, or Maple Stain, and save up to $20 on any Turn Post Chair or Stool purchase; $99.95-$159.95. ~ For more on Sturbridge Yankee Workshop’s Annual Seating Sale, browse more Seating today.